oh no, how can we call for customer service now?...lol. It must be invisible. Nice contrast of colors as dark statement. That's a really funny one - great find! That's a perfect photograph-cartoon! I love it. (Althouth perhaps inadvertently, sadly it illustrates an attitude that we too often find). A very strange sight! It needs an out of order sign to make it even more ironic! Hehehe ! rather difficult ! ahh, those were the days, except with a handset. Clever, Mary! I love that, pick up, but nothing to pick up. Priceless Mary. Perfect, I love it! Lol..I love it. Great shot. 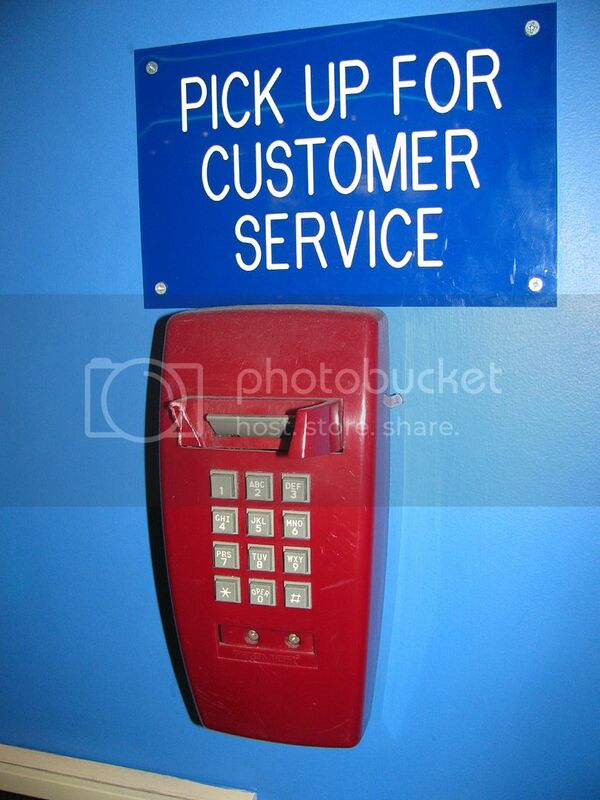 Isn't that what customer service is all about these days? That gives me the sweetest of dreams. what happen to that phone?lol! that is the funniest thing I have seen in a long time...so Charlie Brown! I have encountered similar CS many times ,ha ha !Great Pic ! Love the photo. You have the most amazing ideas for photographs. HaHa! You have a good eye for the ironic! Love the colours. Looks, to me, like they don't want "face to face" customer service!! That phone goes no where!!! Good laugh :) thanks for the link-up! I always wanted a red phone. No Ruby Red Today ? I hope you are well and not sick.